This was the first year the program won their region by toppling Penn State in the Ohio Valley Regional final. Due to their great regular season and a little luck, the program also received their first #1 seed at Nationals. 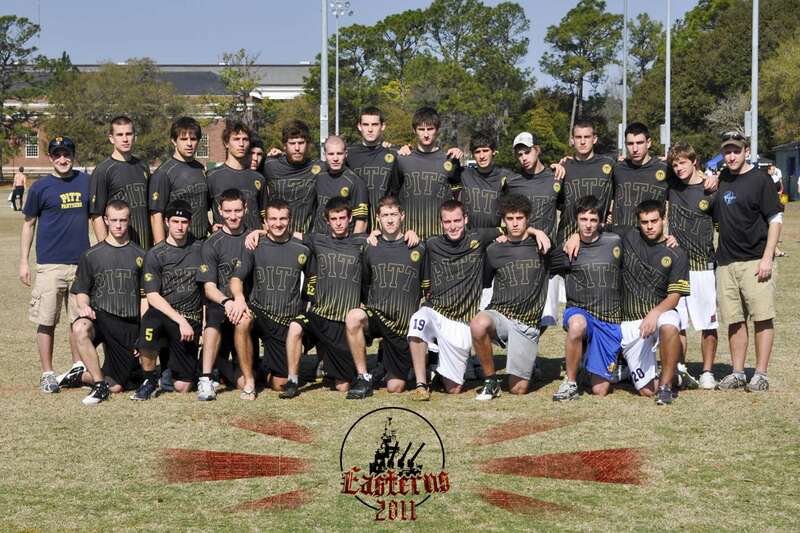 The Pittsburgh-B team formed in 2005. 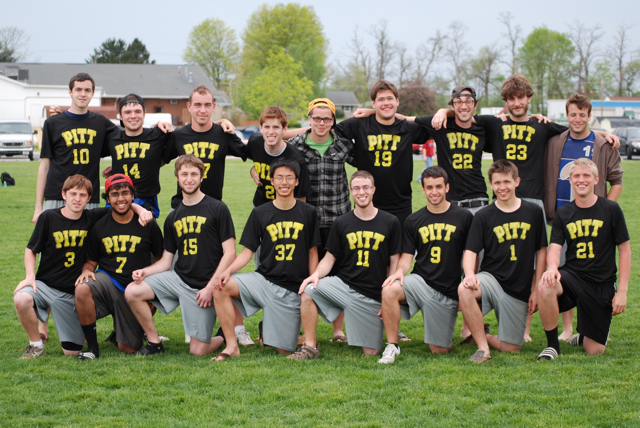 Seven years after its inception, Pittsburgh-B qualified for regionals for the first time. It took the original team five years to complete this same feat. Pittsburgh sent two even squads, X and Y, to this tournament. Squad X took down Squad Y in the finals. Pittsburgh-Y came out in their first game against Case Western B. It wasn’t the best competition, but it was definitely fun watching Eddie jack it to Tyler a few times over some new kids. We got our younger guys running early and Josh, Vatz and Patty Ice all (notably) showed up on time for our first game after getting up at 5 and making the drive out there. The overall competition wasn’t great. Eddie looked awesome. He had a filthy layout grab, actually one of the best catches I have seen in a very long time, against a team like Toledo or something that caused a big boost of excitement. He is definitely in the best shape of anyone we saw (and he should be, with Club Nationals around the corner). Colin was a little banged up but played great when he was in. The end zone O was a little disorganized (a lot disorganized). The zone offense took a while to get going Sunday morning against Case Western A. Pittsburgh-Y actually went down 3-0. Freshman Tyler and Marcus really played well and especially well together including their triumphant victory over Pitt X rookies. Tyler and Plunkett were both playing as you’d expect. Tyler dominating and Plunkett goin off like Brett Favre. Things seem in order. It was a ton of fun getting to watch some of the younger guys like Andy and Steve progress over the weekend. Definitely a positive weekend overall. The girls team also made the finals and were only 2 points short to a very good Michigan team of completing the Pittsburgh sweep in both divisions. Pittsburgh won the first Big East Conference tournament. Skyd: You lost to Virginia Tech on Saturday in a close game but rocked everyone else. You later came back to dominate VT in the final. What did you do differently in your first and second game against VT? Josh Suskin: The wind really picked up in our Saturday game, and turned it into an upwind/downwind game. This neutralized our athleticism and depth, which are strengths of our team. They ran an effective zone, which we did ok with, but we asked our O line to go upwind one too many times. We needed to make a big play down the stretch, and just didn’t come up with one. Credit them, they played a great game and just ended up being one point better. That’s a team who is very capable of making some noise in their region. We were prepared to make adjustments to their zone on Sunday if needed, but it really wasn’t windy. They threw it on their first D point and we sliced through it rather easily. I think everyone realized the game was going to go a little differently after that. We also weren’t too happy about losing a game, so we came out jacked up and ready to play from point one, and didn’t let up until it was over. What was your most challenging game of the weekend and why? The VT game on Saturday was challenging and frustrating. It would be easy to blame it on the wind, but the reality is we just didn’t execute when we needed to. Skyd: What was the weather like? How did it affect Pitt’s play? Josh Suskin: Saturday was much windier then Sunday. I’d say the only game if really affected us was the first VT game, because they’re a team that likes to play zone and obviously the wind favors that. Aside from that, I don’t think weather had much bearing on what we were looking to do. Skyd: What strategy did you use to be able to dominate the field so handily? Josh Suskin: We like to play aggressive on defense, and smart on offense. Our offensive has a very “take care of business” mentality when they’re on the field, and did a great job over the course of the weekend. We have a very hard nosed defense, who really prides themselves on getting on the field and staying there. Skyd: Who made big plays this weekend? Josh Suskin: We win as a team and lose as a team. Everyone has a role and plays into the system, and it results in a lot of different people being able to showcase what they can do. When asked for input on who was the tournament MVP, I wasn’t able to come up with an answer. I really think everyone on our team was able to make a contribution over the course of the weekend to what we were able to accomplish. Skyd: What does Pitt need to work on as a whole for the spring? Josh Suskin: We have very high expectations for our team, and this weekend provided a great opportunity to evaluate where we are, and what needs improvements to get to where we want to be. I’d say the biggest thing we need to work on is just experience playing with each other. We’ve made some personal changes on both sides of the disc, and people need to get comfortable playing with each other and recognizing what they’re supposed to be doing on the field. In terms of specifics, our pulls were pretty terrible over the course of the weekend. Skyd: What’s one team to look out for come the spring and why? Josh Suskin: I’d imagine the Florida’s, Carelton’s and other big name programs will all be good as they always are, but we don’t really concern ourselves with other teams. We really just like to focus on our own team, and maximizing our own potential. We can’t control who we play and what they do, so we just try to make sure that they’re playing the best Pitt team possible. Skyd: How was the tournament run? What was the impact of observers on your games? Did you like the formatting? What calls did you like, what did you not like? Josh Suskin: Mike Gerics has been running some of the best tournaments in the country for years, and the UOA system him and Jason Weddle have put together has only increased the overall quality. While sometimes it’d difficult to make adjustments when you’re asked to not do things you’ve been engrained to do (such as calling travels), the overall flow of the games have a tendency to be much smoother. At this point, I’m not sure the observers have a huge impact in our games, as the majority of games we play in are observed. However the UOA system helps keep the game flowing and really let’s players focus on just playing, rather then having to deal with the other aspects that you can sometimes get caught up in when players are responsible for every single call. -Excerpt from Skyd Ultimate tournament article. per game. Pitt cruised thru Sunday pool play with wins over Brandeis, Tennessee and James Madison. difference-wise) from their Sat loss to Pitt, so VT claimed the 2 spot by only 2 points. Pittsburgh went on to beat Virginia Tech 15-7 to claim the first UOA Fall National Championship. Whoa. Bold prediction, but only slightly off. National Championship by a final score of 15-7.
awesome deep flicks for goals was the first to grab it. Pitt opted to skip their February tournament because of the traditionally bad weather. This made the Stanford Invite En Sabah Nur’s debut to the 2011 season where they would face 10 of last year’s teams at nationals a 12 teams that are ranked in the top 20 this year. On Saturday in pool play, they slowly shook the rust as they defeated San Diego State and California-San Diego. Unfortunately, they didn’t shake enough off to win the pool against Oregon. On Sunday, Pittsburgh showed they had the talent and mental toughness to play high level college ultimate. They mounted two major come backs against British Columbia and Colorado to win their quarterfinal and semifinal matchups. This put them in the finals against last year’s national finalist, Carleton. Unfortunately, Pittsburgh was out of gas at this point. Carleton was fresher and was able to cruise to a 15-8 victory. This was a great first tournament for Pitt. To get a look at some game footage check out USA Ultimate’s Stanford Invite highlights. Oregon came out this game gunning for the #1 pool seed Pittsburgh. They broke Pittsburgh on their offensive point and kept rolling to take half at 8-5. Pittsburgh just wasn’t able to shut down their cutters and generate the turns. At 14-11, Pittsburgh finally woke up and showed the mental toughness to dig themselves out of their and hold and tie the game up at 14s. Unfortunately, Oregon was able to score on offense and finish it on D to win the pool 16-14. It was great to see Sabah be mentally tough enough to dig deep and not just let the game go when it was game point. While they didn’t pull out the win, this gives them an extra game on Sunday and will leave them hungry. Sunday morning while warming up to play Tufts, Andrej said, “Tufts doesn’t know what is about to hit them” and they didn’t. Sabah just came out and dominated the game from the first point. They went up 3-0, took half 8-3, and won the game 15-6. Tufts is a good team, but they just don’t have the depth or talent of Pittsburgh yet. The most notable thing about this game might have been the Tufts player who kept stepping into Tyler when Tyler was sprinting since they could not contain him any other way. Tyler talked to the observed, but he kept happening. After the third time, Tyler pushed back. Pittsburgh came out a little flat in this game as well. Colorado came out strong and took half 8-5. However, Pittsburgh showed their depth and mental toughness again as they dug themselves out of another deficit. En Sabah Nur took the lead at 12-11 on this spectacular break from Eddie Peters to Ethan Beardsley. After that break, the teams traded out to the hard cap at 14. Pitt wins 14-13. 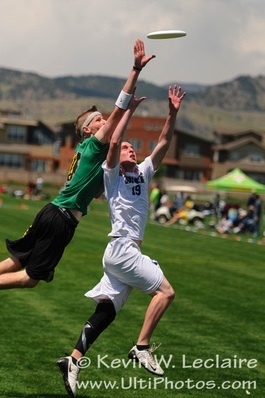 One of my favorite plays of the weekend was after Andrej was on the receiving end of a Colorado defender’s spectacular sky, he went on to get a head block to the disc back before they punched it in. I’m calling this game a wash. Pittsburgh had played 78 points on Sunday before coming into this game. Carleton had only played 44. Though, part of this was that Carleton had one less game, it also came because they finished off their quarterfinal and semifinal opponents off quicker. Pittsburgh just didn’t have the legs to get it done. David Lionetti and David Vatz share their thoughts on Pittsburg’s win over Colorado and upcoming game against Michigan. “Though Pittsburgh broke to start the game and looked more focused in the first few points, Colorado was quick to respond by turning in one of its best defensive performances of the season, fighting back to go into half down only one break, 8-7. Pittsburgh held out of half to make the score 9-7, but Colorado’s ability to force Pitt into rushed throws in their fast break defensive offense along with the stead play of Jack McShane brought the score to 9-9. Up 11-10, Pitt’s Eddie Peters came up with a huge block close to the Colorado endzone line that Pittsburgh punched in for the break, 12-10. While Colorado would hold on the next point to make the score 12-11, it would miss the next break opportunity A huge Jimmy Mickle pull hit a towering light pole fifteen yards off of the sideline, and Pittsburgh capitalized on their field position to punch in the easy score. All day, Pitt’s endzone offense looked steady on both offense and defense, with handlers Alex Thorne, Chris Brenenborg, and Isaac Saul constantly threatening to break the mark while Pitt cutters showed both speed and discipline. 8 seconds of incredible D.
2 seconds of wonderful luck for any Florida fan. “While many expected [Florida] to struggle when up against Pittsburgh’s tenacious defense without their offensive star Cole Sullivan, they did not, remaining poised and committed to keeping the disc alive on the dump and hitting taking deep chances when a teammate was open. Florida was also helped in the first half by Pittsburgh’s decision not to throw a zone or force middle, strategies that may have forced Florida’s interim handlers to make more throws into difficult-to-hit spaces. While the teams went into half on serve at 8-7, Florida, Pittsburgh certainly missed its chance to earn a few breaks in Sullivan’s absence. Out of half, Pittsburgh’s Alex Thorne stood out quite a bit, getting open at will and throwing give and goes all the way down the field. His work on Pitt’s first point, however, was for naught, as Florida converted a missed breakmark attempt on the endzone line into a break that made the score 9-7. On the next point, Thorne pulled down a huge sky over the much bigger Sullivan to bring it to 9-8. He would continue to impress throughout the game, coming up with another layout catch for a score and consistently making difficult throws look easy. At 11-9, Florida called timeout on the endzone line and earned another break after blocking Pittsburgh twice (the first was a Coleman Hoover layout and the second was a sky by Gaines on Pitt’s Tyler DeGirolamo). Throughout the weekend, no team used its timeouts as well as the Gators. With the score at 13-11 and the horn blowing to point cap the game at 13-11, Pittsburgh threw a zone that took them on a run, bringing the score to 14-14 and looking like they might steal the win. With an upwind pull that landed halfway back in Florida’s endzone and very close to the sideline, Pittsburgh set a flick-forcing zone. Alex Hill picked up the disc, and while his teammates worked to find open space, Hill saw nothing that he liked and called a timeout. What happened out of the timeout was surreal. Required to set first because they were on offense, Florida lined up Gaines as Hill’s dump. Sullivan, Sage, Travis Catron, Glenn Lenberger, and Jeff Kale, were all 50 yards downfield. With Pittsburgh setting up the same cup that the came down in, everybody knew what was coming. As the disc was tapped in, Hill stepped back, wound up, and let it fly. The Easterns fields are surrounded by a group of huge light poles, all standing about 15 yards off of the sidelines. Earlier in the day, Colorado’s Jimmy Mickle had hit one with a pull, stopping Mamabird’s momentum in their quarterfinal game against Pitt. As though it was designed for dramatic effect, Hill’s huck soared around the nearest light post and began to float down into a wolfpack of Gators and En Sabah Nur players that were jockeying for position. At first, it looked as though Sullivan was going to make the grab. After all, he is known more for his ability to box out and will himself to a disc than he is for being a big leaper. When he jumped, though, Pitt’s DeGirolamo applied enough pressure to make Sullivan tip the disc but not bring it in. phil b says via RSD, “i put a stopwatch on that stall count and got to 10.5ish.with the noise it’s hard to tell when the stoppage happens, tho. nice work Pitt for having a legit stall count. Sabah tried something new this year. Instead of sending enough players to play wiffle ball between rounds, Sabah only sent half their team. They still won it. The Program has come a long way. With only one bid to nationals out of the Ohio Valley Region, one of two streaks was going to come to an end. Pittsburgh would not make nationals or, after six years of winning the Pittsburgh Cup (the backdoor/2nd Place game), they would win their region. Despite some strong showings by Dickinson and Millersville, Pittsburgh was able to finally bring home their first Regional Championship. Here is USA ultimate’s recap of regionals. On paper, the marquee match up was Colorado and Pittsburgh. These were the tournament’s top two seeds coming into the weekend, and while Pittsburgh owned a 2-0 pre-Series record against Colorado, each of their previous games was close. This one was not. Colorado jumped out to a 5-0 lead on the strength of physical defense that forced Pittsburgh to throw the disc into tightly guarded spaces, and with its offense connecting on deep shots, Mamabird never really looked back. Pittsburgh was able to trade points with Colorado after an 8-3 half, but the effort was too little, too late. Pitt-B rolled in to the Dilla household to hang out with Roger, his parents, his bearskin rug, his handmade barn, and homemade foods including; apple pie, iced tea, tacos, chicken dip, sausage (made from freshly hunted venison), and applesauce. It was pretty legit. Reflections: Steve blew Rookie of the Tournament by locking Ari’s keys in his trunk, leaving the award to Alex by a nose over Frank and Rodger. Pitt takes 9th very easily, and probably should’ve gotten 5th. It was a good first showing, but the bottom line is that there was no big win at this tournament. The team’s anxious to get that win, and well… is having a lot of fun. the game away on a huck pulled in by Earles, and a quick dish to end it. Bagels bagels bagels. Pickles pickles pickles. tragic than the L was the loss of Weiman to a knee-on-thigh collision. an impactful injury to Boro’s best player’s elbow under the mighty thigh of coach Ari. Ryan. The teams traded to end the game, 13-5.
you know it!” Food comas all around! a field position game. PHUL takes half 8-2 after figuring out the zone before Pitt did. players to watch in their college careers. wish-I-hadn’t-called-that Land. The game was over right there. cheer “Backyard Brawl” we returned by simply saying one word: “Syracuse”. exchange Fonzi looks on the sideline. It’s gonna be a good year. Pittsburgh-B finished 14th at this tournament. So, this game turned into our first real battle of the season. In a very upwind/downwind game, both teams resorted to basically just try to huck and hope up field and go zone the other way. For both teams we needed to go over the cup to beat the zone. Wei had atleast ten d’s in the d line. O line was effective. After short runs from both teams at the beginning, we traded the rest of the way. One of our guys got a massive case of the dropsies and on what looked like it was the last point of the game, had a bad drop. Messiah scores, then is able to work the disc all the way up the field to score on the following point. Game over. Not our best effort, not really ultimate, not really acceptable. Nothing notable in this game. This team is really bad. The one thing I learned was that cleats do come in pink. What a terrible start. We went down 3 immediately. Eric Turffed one. Simple turns really qucik. And St. Joes totally capitalized on the quick turn and scored immediately. At a point we were down 5-1. We got our heads down, but then we came back. 5-6 at one point. We went to 11s. Lose the game on universe. We played very well, just with a start like that we can’t do much about it. Team National Championship. Unfortunately for them, they ran into Florida in the final, who were virtually untested thus far in the tournament. This tournament win was the culmination of an entire season of hard work. Full article at USA Ultimate’s website.